I can remember that as a child, I had the experience of being transported down the streets of Durban in a cart on wheels…it was called a Rickshaw! As part of the holiday this was definitely a highlight! 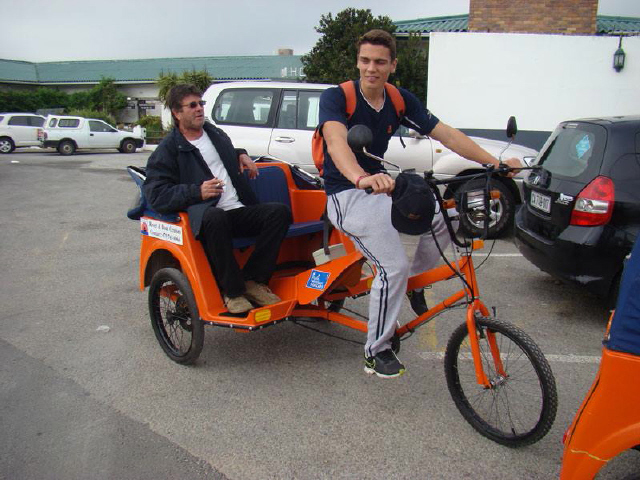 Pretoius “Tollie” Bezuidenhout (Owner of Tollies Boat & River Cruises) started researching the idea of a Pedicab about a year ago. The purpose of the Pedicab is to provide environmentally friendly transport in a fun and economical way. It also boosts the local economy by providing jobs to the drivers. 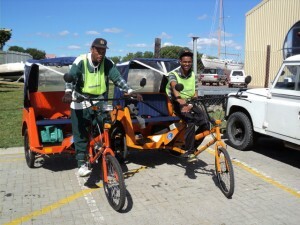 Three Pedicabs have been launched as a start to this project. The maximum weight that can be transported is 200kg. Two adults of an average weight would be able to enjoy a ride together. Different routes will be available and charged accordingly. 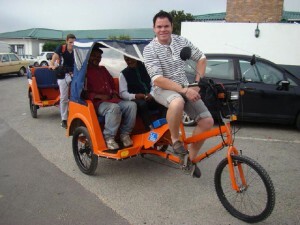 To enjoy a full days travel, you can rent the Pedicab at a daily rate. just sit back and RELAX! What an interesting and fun filled way to travel the streets of the Velddrif area! Do yourself a favour…visit Bokkomlaan…in a PEDICAB! This entry was posted in WEST COAST and tagged Adventure, Attractions, LAAIPLEK, PEDICAB, PORT OWEN, transport, VELDDRIF, WEST COAST by ANNIE. Bookmark the permalink.